Teaching has long been considered as a very respectable, admirable and valuable career. Teachers come from all walks of life, with different experiences and important life lessons that can be passed on to their students. Becoming a teacher is actually a relatively uncomplicated process, with people of all ages and backgrounds entering the teaching profession. Similarly, the role of teaching assistants and learning assistants are also viewed as incredibly valuable to the education sector, especially since class sizes and teachers' roles and responsibilities seem to be increasing with each year that passes. If you've ever considered a career in the education sector as a teacher or teaching assistant, here's how you can make the change and start the ball rolling. The type of training and qualifications you'll need is dependent upon your previous experience, and what age group (primary or secondary education) you intend to work with. If you've previously worked with children through either voluntary or paid work, this will be extremely advantageous to your training and employment prospects. Teaching involves working with children of all abilities and different backgrounds, as well as dealing directly with parents, so patience and good communication skills are a must. Teachers organise their timetables and lesson plans, so your organisational and management skills should be top notch. Children can be very challenging, so a sense of humour is also handy! All prospective teachers need to meet certain standards, so set levels of numeracy, literacy and Information Communication Technology (ICT) skills are required. Prospective teachers also need to pass a Criminal Records Bureau (CRB) screening before commencing their training. Both primary and secondary school teachers are educated to degree level. Primary school teachers will also need GCSEs or equivalent qualifications in Maths, Science and English with grades A-C. Because secondary school teachers specialise in one or two subjects, a degree that is in the subject that you wish to teach will also be required. Some universities will also recognise Access to Higher Education course as a valid qualification. To become a primary or secondary school teacher, you'll need to achieve QTS (Qualified Teaching Status). This is done through Initial Teacher Training (ITT), which can be undertaken through 4 different routes: an employment-based route, undergraduate and postgraduate routes, or school-centred initial teacher training (SCITT). If you are interested in taking the Undergraduate Route, you will need to choose a degree in the subject you want to teach, if you intend to teach in a secondary school. This would then be followed by a PGCE. A BA (Hons) or BSc (Hons) degree alongside QTS is another option, or you can work towards a Bachelor of Education (Bed) degree for both primary and secondary teaching. The employment-based route allows for training on the job, but you will need a degree or two years of higher education to take this route, and there are a limited number of places. Similarly, the SCITT route requires that you have a degree and the training takes a year to complete before you are ready to train for your PGCE. If you already have a degree, at almost any age you can take the postgraduate route, known as a PGCE (Postgraduate Certificate of Education), just as long as you have a degree that is in a subject relevant to the primary National Curriculum. Interestingly, PGCE courses usually last for a year if full-time, or can be taken as a two-year, part-time course, with opportunities to undertake some distance learning, too. At present, the national pay scale for qualified teachers is from £21,588 to £31,522. Advanced skills teachers can earn up to £56,950, with head teacher and management positions being higher still in some cases. Pay scales are higher in inner London due to the general higher costs of living. If you want to work in education and the classroom, but don't fancy a job as a full-time teacher, then the alternative of working as a Teaching Assistant (TA) or Higher Level Teaching Assistant (HLTA) is always an option. Working as a TA is a great opportunity for those that have additional family responsibilities, as the work is undertaken only in term time, with sometimes flexible and part-time opportunities. However in both cases, whether undertaking paid or voluntary work, you'll have to pass a Criminal Records Bureau screening. 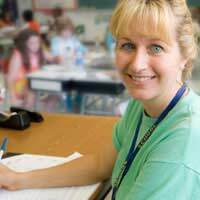 Teaching Assistants also go by the name of classroom assistant or learning support assistant. A TA's primary role is as a support to the teacher in the classroom. Depending on the school, this role can include many responsibilities and duties, the most common being supporting and supervising educational games, sports and craft activities, helping children with their reading, administrative tasks and providing extra support for children with special needs. In many cases, TAs can work with smaller groups of children, such as those that excel or struggle with particular literacy or numeracy skills, or work on a one-to-one basis with a particular child. Bilingual TAs can also work in schools where there are many children whose mother tongue is not English. To become a TA, it is very helpful if you have some experience of working within a school or with children. Regular Voluntary Work within a school is the best starting place. There is no set entry-level qualification for TAs, as this is dependent on your Local Education Authority (LEA). In some cases, if you are deemed suitable for the job owing to your employment experience, you can gain an employment-based qualification, such as a Level 2 Certificate for TAs, or an NVQ Level 2 in Supporting Teaching and Learning in Schools. There is scope to develop your career towards working as an HLTA. You should be aware though that HLTAs will require further skills and educational development, with the support of the school's head teacher. This is because HLTAs provide extra support to teachers with supervision and learning activities, as well as assisting with lesson plans. In some cases, HLTAs are also qualified to take lessons in the absence of the teacher. If you would like to work in the education sector but you're not sure if teaching in a school is the right path for you, why not consider a career in Further Education Lecturing and Tutoring? I have my Nvq 3 in social care I have worked voluntary for parent line and have great knowledge of the work Bernard is do and child protection. I have my years of experience from bringing up my 3 children. I have been working in care for 14 years so have many time management and communication skills also worked for Alzhiemers society doing therapy work. Now at 50 I'd like a full time job working in a school but is it to late for me to become a TA ? No it's never too late. Many schools are happy to consider slightly older people for these positions as they bring a different kind of contribution to the school environment. Don't forget, official retirement age is probably 67 or 68 so there's a good few years that you can give to any school. I have my Nvq 3 in social care I have worked voluntary for parent line and have great knowledge of the work Bernard is do and child protection . I have my years of experience from bringing up my 3 children. I have been working in care for 14 years so have many time management and communication skills also worked for Alzhiemers society doing therapy work . Now at 50 I'd like a full time job working in a school but is it to late for me to become a TA ? I have been a stay at home Dad of three for the last 8 years and now would like to retrain as a primary school teacher. I have the relevant GCSEs, A levels and a 2:2 degree plus PGDip in business studies. I have been employed in the past with major retailers as a buyer but have not actively worked since 2010. Would I be eligible to retrain on the job earning a salary with tuition fees paid or would I have to fund this myself? Also, when should I start applying for 2019 intake? I have been a stay at home Dad of three for the last 8 years and now would like to retrain as a primary school teacher.I have the relevant GCSEs, A levels and a 2:2 degree plus PGDip in business studies.I have been employed in the past with major retailers as a buyer but have not actively worked since 2010.Would I be eligible to retrain on the job earning a salary with tuition fees paid or would I have to fund this myself?Also, when should I start applying for 2019 intake? Hi.i am interested in becoming a primary school teaching assistant.i have GCSEs,A levels and a third class degree.i don't have gcse maths.i am worried this may be a problem.I work part time,and do voluntary work at a children's playgroup once/twice a week.i am a forty year old mum of two.this is my calling.i am at a crossroads now,turned forty 3 days ago and this is my dream. There are lots of places where you canre-take your maths GCSE if you really want to follow this is course. Check teaching courses and on the job teaching programmes near you. Often the requirement for entry on to a post grad teaching course (e.g PGCE) is a minimum 2:1 honours degree but some institutions will look at all your relevant experience and other qualifications etc. I have a nursing degree and obtained a 2:1.I'd like to know if I can use this to get into teaching. I have an NVQ level 3 supporting learning and teaching in schools and have recently achieved HLTA status but no degree.I am now wondering if there is an option to qualify as a teacher without needing to get a degree first or is this just not possible. Any advice would be greatly appreciated. I have an NVQ level 3 supporting learning and teaching in schools and have recently achieved HLTA status but no degree. I am now wondering if there is an option to qualify as a teacher without needing to get a degree first or is this just not possible.Any advice would be greatly appreciated. There are various routes into teaching now. You can sometimes apply for teaching assistant roles if you demonstrate that you have completed your education to A level orequivalent. It's sometimes then possible to do on the job training to become a teacher. Alternatively you will need to take a BEd degree or a degree in another subject followed by a PGCE. Type in the search term "teacher training" into a search engine and you will find lots of useful information relevant to your own area. Hi I am 35 years old, I hold an undergraduate degree in Forensic Psychobiology (2:1) which I obtained 13 years ago... I have been working as self employed in managerial roles within the Post Office sector for many years and now would like a change of career and would like to train as a primary school teacher which was my initial goal... I would like advice on where to start for training/teaching courses and work placements as I am not sure. Would I need to study for another degree again to gain PGCE? Would I be able to receive funding? I am currently a full time mum to two primary school children residing in Scotland. Hi I have a third class honours in Genetics completed in 2001. I'm 36 and have been working in hospitality for over 16 years. I would love to become a teacher but have no idea where to start, can i use my degree to get me on postgrad course? How can i pay my bills , mortgage etc while studying especially since if i have to do a full undergraduate course again I cannot get any funding as I already have a degree. Any advice on where to start would be greatly appreciated. Hi?? I am a licensed teacher in the Philippines. I have a two year experience in teaching. I would like to know if I am qualified for a teaching assistant job here in the UK. Do I still need to study here or take some course related to TA? Thank you so much in advance for your response. Hi, I have been working as an art technician for approx 9 years now and have been assisting in classes on a number of occasions through those years so have a good understanding of teaching and assisting pupils. I also have a degree and am thinking about making the leap into being a TA. Does my current experience stand me in good stead for jumping straight into a level 3 nvq which is usually required to apply for ta roles? Ideally I would like to do the training on the job but would prefer to apply to another school instead of carrying on at the one I am at now. Many thanks. Presently living abroad and have hons degree in pharmacy - trying to get an employment on the job training to become a teacher when I return to Scotland very soon but finding no help at all apart from referring me to various websites. Surely there must be an easier way when teachers are in so much demand. I have a clean record, recently separated, with one teenage child abroad. The various websites you've been directed to should really give you details of how this as well as the traditional university route. Most LEAs (in England at least) have a list of schools that participate in the various School Direct schemes. So make contact with them first. Alternatively ask at specific schools to see whether they participate in any of the school based training schemes (note: there are unpaid and paid versions of these). Presently living abroad and have hons degree in pharmacy - trying to get an employment on the job training to become a teacher when I return to Scotland very soon but finding no help at all apart from referring me to various websites.Surely there must be an easier way when teachers are in so much demand.I have a clean record, recently separated, with one teenage child abroad. Hi, I studied health and social care level 3 extended diploma in college does this qualify me to work as a teaching assistant? Also i'm on my first year of studying my degree in special educational needs and disability studies, so i would like to get a part time TA position. However was not sure whether I have the qualifications to do so. I completed my chemistry degree in 2016 with a 2nd class honors (2:2) I've been working in a laboratory for 7 years and would like to change my career. I'd love to teach at primary schools and have a passion for maths, science and engineering. What options do I have become a qualified teacher? I need to be able to do it part time as I cannot afford to quit my job. There is a big demand for science/maths based teachers in both primary and secondary education, so it's worth taking a look at the incentives available. Many universities are offering part time postgrad courses, but you will still need to find the time to undertake your teaching placements as these are feature of all routes into teaching. Some schools offer on-the-job training to QTS status. The Get Into Teaching site has more detailed information. Hi, I have just completed teaching assistant level3. I have got degree from india that was compared from Ncirk they said, considered qual uk degree.I wish to become primary teacher in future.where should i go to collect more information, is they accept degree or what else i need to do? I completed my chemistry degree in 2016 with a 2nd class honors(2:2) I've been working in a laboratory for 7 years and would like to change my career. I'd love to teach at primary schools and have a passion for maths, science and engineering. What options do I have become a qualified teacher? I need to be able to do it part time as I cannot afford to quit my job. I am qualified social worker (dipsw) With experience working in a residential setting with children and also as a supervising social worker in a fostering team. Is this a sufficient amount of experience/qualification to apply to do teaching assistant work within a primary school? It may be considered sufficient, each school/employer has different criteria. It's worth asking at different primary schools, they may consider taking you on and training-on-the job, or taking a part time education based qualification.